Apart from looking slimmer, burning belly fat carries additional health benefits. It can help lower the risk of various serious ailments such as diabetes and even heart disease. Being overweight, especially carrying more weight around the belly region is a growing problem all over the world. This can be largely attributed to our diets and lifestyles with much less physical activity than in the past. It can be difficult to avoid some parts of this since most jobs these days leave you desk-bound which means that you spend a large amount of your day being inactive. Luckily there are still some parts that we can control and decide that we want to better them. This might mean that we have to focus much more and the parts that we can very well control, such as what we eat. There are some foods that are great in burning belly fat, read on! as you discover some of them. High-fructose corn syrup (HFCS) is an industrially produced sweetener that is used in all kinds of food to enhance the flavour. It can be found in sweet-things like cold drinks, fruit juice, cereal, and sweets. But it becomes a bit more tricky when we look at foods that don’t taste sweet, but are still filled with HFCS. These foods include certain ketchup, soup, bread, yogurt, and mayonnaise. Whole-grain foods like barley, bulgur, raw oats, whole-grain pasta, whole-wheat bread, and whole-grain cereals are good sources of whole-grain and are usually filled with healthy fiber. This means that it is great for digestion, and to lower the risk of certain health issues like heart disease, insulin resistance, type 2 diabetes, and even certain cancers. Stay away from refined-grains like white bread, white rice, cake, and cookies. These may have the opposite effect as whole-grains. Monounsaturated fats are the good fats. They can help prevent the formation of fat around your mid-section. 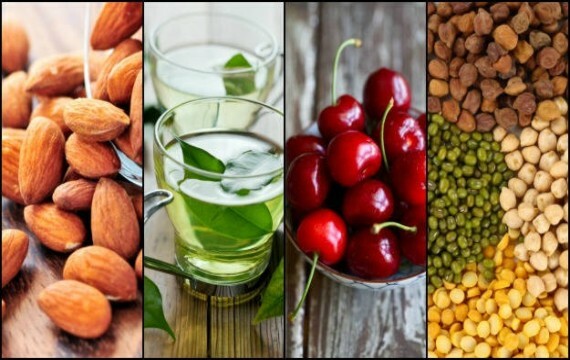 They can also decrease levels of bad cholesterol and the risk of stroke and heart disease. Foods that contain these healthy fats are olive oil, canola oil, avocados, nuts and seeds. We are often so obsessed over what we eat, that we completely neglect what we drink. Most alcoholic beverages like beer, wine and spirits are quite high in calories and carbs, which means that they can cause the weight to pack on quickly. Maintain this foods and burn down your stomach fat easily. Are you having any further questions? you can use the comment box below and they will be attended to. Great post, very informative. I need to eat more of these!